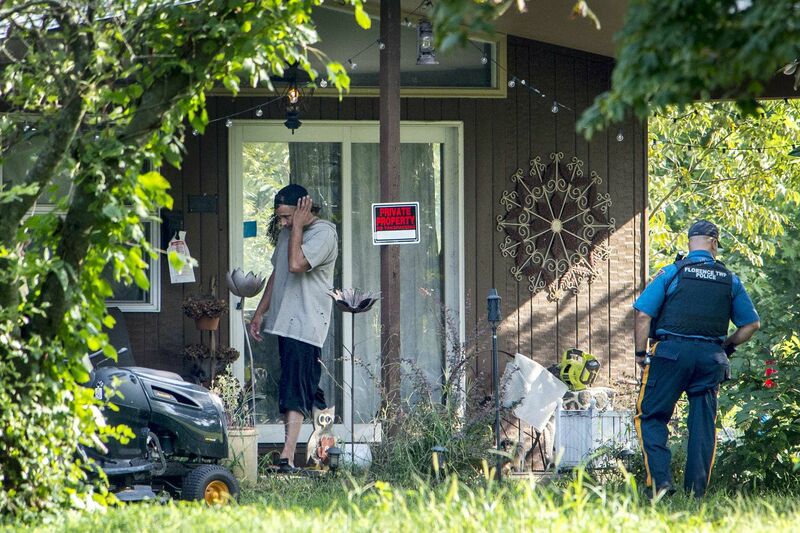 Mark DÕAmico.stands outside the house he shares with Kate McClure in Florence Township as a policeman stands guard while police execute search warrant September 6, 2018 looking for evidence in the disappearance of $400,000 in GoFundMe money meant for Johnny Bobbitt, Jr, the drug-addictd homeless man the couple befriended earlier this year. The Burlington County Prosecutor’s Office has launched a criminal investigation into $400,000 in missing GoFundMe donations collected to help Johnny Bobbitt Jr., a homeless man whose kindness to a stranger touched hearts across the nation and beyond. On Thursday morning, law enforcement officials searched the Florence Township home of Kate McClure and Mark D'Amico, who set up the campaign for Bobbitt after he used his last $20 to buy gas for McClure when her car stalled on an I-95 overpass near Kensington last year. The campaign was wildly successful, attracting more than 14,000 donations. But the couple's stated plans to buy Bobbitt a home and set up two trusts to ensure his financial independence quickly dissolved, and Bobbitt accused them of squandering the money and spending it on vacations and a new car. He sued them to try to recover the donated funds, but earlier this week, a lawyer for the couple said the money was gone. Early Thursday, Florence Township police and investigators from the Burlington Prosecutor's Office executed a search warrant on the couple's home, confiscated several bags of evidence, and towed away the couple's BMW. By evening, GoFundMe, which has been assisting law enforcement with the investigation, announced that the company would guarantee that Bobbitt would receive all of the money that was intended for him. "Johnny will be made whole," said GoFundMe spokesperson Bobby Whithorne, "and we are committing that he'll get the balance of the funds that he has not yet received or benefited from." Authorities began investigating after Bobbitt, 35, told the Inquirer and Daily News last month that he feared that the couple had spent much of the GoFundMe money on vacations, gambling, and shopping sprees. McClure and D'Amico bought him a camper and parked it outside their home, but Bobbitt said they later sold the camper, kept the money, and sent him back to the streets. The couple, who drew national attention for their efforts to help Bobbitt, are now embroiled in a criminal investigation in addition to the civil suit. Burlington County Prosecutor Scott A. Coffina on Thursday declined to comment on the inquiry. Bobbitt said in his lawsuit that McClure, 28, and D'Amico, 39, used the GoFundMe account as their "personal piggy bank." Last week, a Superior Court judge ordered the couple to turn over any remaining money, and their attorney disclosed that there was nothing left. The judge also ordered the couple to testify at a deposition scheduled for Monday. Their lawyer, Ernest E. Badway, said the two would invoke their Fifth Amendment rights against self-incrimination. News of the missing money quickly sparked an investigation. As law enforcement officials converged on the couple's property, McClure remained inside the house. D'Amico stepped outside, chatted on his cellphone, played with his dog, and hit a few golf balls. Soon gone was the BMW that D'Amico, a carpenter, said he bought McClure, a receptionist, as a gift. Authorities put it on a flatbed and hauled it away. The couple denied spending any of the GoFundMe money for personal use, save for $500 that D'Amico said he used to gamble at SugarHouse Casino. He said he immediately returned the money from his winnings. At the time of the raid, there was a bench warrant out for D'Amico's arrest in an unrelated matter, but authorities did not take him into custody as he spoke with them while they carted away boxes and loaded them into sedans. The warrant had been issued this summer when he failed to appear in court for traffic violations that included driving with a suspended license earlier this year. After the search concluded Thursday, D'Amico eventually drove away in McClure's other car, a white Subaru, ignoring reporters who shouted questions at him. Earlier in the day, McClure had done the same. D'Amico was arrested in May after he was pulled over for a broken light on the car he was driving, a municipal court clerk said. At the time, he was wanted for failing to appear in court on previous charges of driving with a suspended license in October 2017 in Burlington City, authorities said. He was briefly jailed before McClure posted $500 bail to free him, the clerk said, but the money was later confiscated and the bail revoked after D'Amico twice did not show up for court hearings. Coffina, the prosecutor, and Florence Police Chief Brian Boldizar said Thursday that they were unaware of the warrant and that they would look into the matter. Boldizar said authorities typically check for warrants before conducting a raid. Before their relationship with Bobbitt deteriorated, McClure and D'Amico told GoFundMe donors they had bought him an SUV and a new home. That home was the camper, titled in McClure's name. The 20-year-old Ford SUV, also titled in McClure's name, soon broke down. Bobbitt, meanwhile, battled a drug addiction and did two stints in rehab. McClure and D'Amico said they withheld much of the GoFundMe money from Bobbitt out of worry that he would spend it on drugs. They said they gave or spent $200,000 to help him. Bobbitt said they spent nowhere near that much. The couple also said Bobbitt stole from them to get money for drugs. In an interview last month, McClure and D'Amico said they did all they could to help Bobbitt. "People trusted us to make sure this money went to something good and not him using it for drugs," D'Amico said. Early the next morning D'Amico sent a reporter a text saying Bobbitt's accusations were "killing Kate." "She's not like me … she cares what people think," he wrote. "I will do whatever it takes to protect her." Bobbitt, for his part, admitted using some of the money for drugs, including Suboxone, a prescription drug used to wean off opiates. He now has several attorneys from Cozen O'Connor assisting him pro bono with his civil suit against the couple and helping him get into drug treatment. Staff writer Avalon R. Zoppo contributed to this article.